The nightly news and other media provide a constant reminder of illegal drug transport over American borders and along routes between various U.S. cities. The general public is well aware that law enforcement efforts to address the foreign supply and trafficking of illegal drugs into the United States is an ongoing battle.This useful and readable compendium gives a fascinating account of how illegal drugs are transported into and around the United States and throughout its neighborhoods. Criminologist and geographer George F. Rengert takes a unique approach to the problem of illegal drug distribution and U.S. drug markets. Using maps and charts to illustrate his findings, Rengert applies spacial diffusion models to the illegal drug trade and explains why certain drugs are transported and found in different parts of the country. For example, the highest concentration of marijuana plants is not on either coast, but rather across the middle of the United States?throughout what is known as the corn belt. 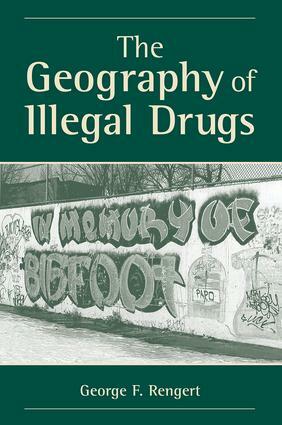 At the local level Rengert assesses the patterns and processes that interconnect drug sales and neighborhood deterioration and change.The book also addresses the important issues of how illegal drugs in this country operate on wholesale and retail levels and ways in which law enforcement at the federal, state, and local levels contend with this widespread problem. Using ethnographic material to provide real-life examples, Rengert explores how drug dealers on the street expand spatially and predictably in their neighborhoods. He illustrates how this knowledge helps law enforcement in efforts to get these drugs off the streets.